Time to relax in the garden and soak up the sunshine , so do it in fabulous style and comfort , sun loungers have moved on those loungers of our youth with stretched canvas on a metal frame. Sun loungers are now a statement in your garden or by your pool with sumptuous padding to rest on and fabulous eye catching design. Contemporary white lacquered aluminium canopy daybed. 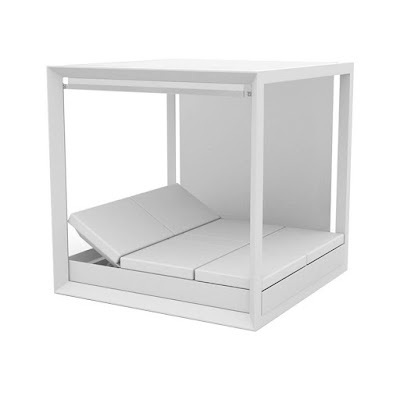 Lounge this summer in style with the Vondom Vela Pergola Daybed Lacquered White. Designed by architect Ramón Esteve for Spanish outdoor living icons, Vondom, the Pergola daybed is a futuristic modern garden furniture addition for your al fresco entertaining space. 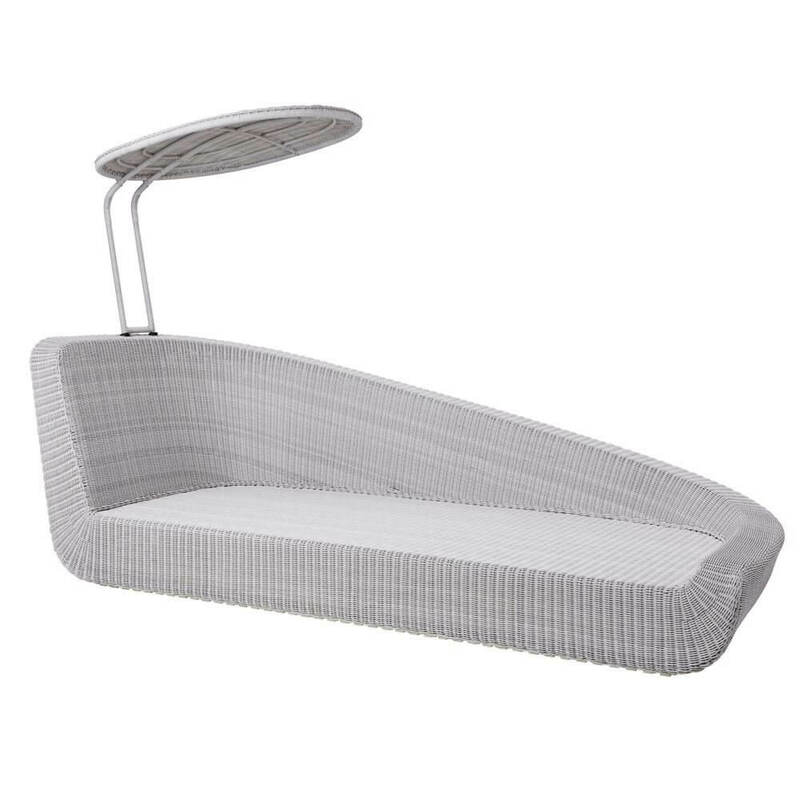 Created to give the impression that your outdoor furniture is floating from the ground, this lacquered white aluminium daybed promotes an atmospheric ambience and new dimension where you need it most. Rectangular in shape with a shade-providing canopy frame, Vela's unique aesthetic is balanced by perfect proportions. Seek sanctuary from the glorious rays of the warm summer sun with the Ethimo Essenza Sun Lounger Bed.Master crafted by luxury garden furniture experts, this commanding double bed sun lounger with curtain canopy creates a lovely shaded spot to retreat to during the hottest hours of the day. 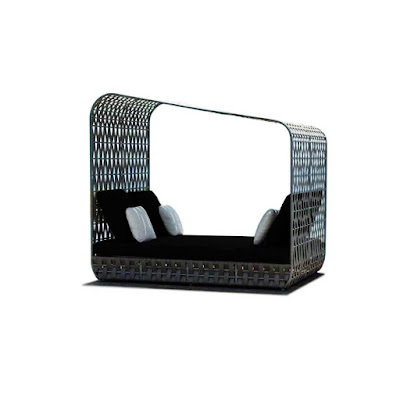 Easy to assemble, the frame features a strong natural teak construction and clear lacquered finish to protect its luxury aesthetic from atmospheric agents, chlorine, water and UV exposure. 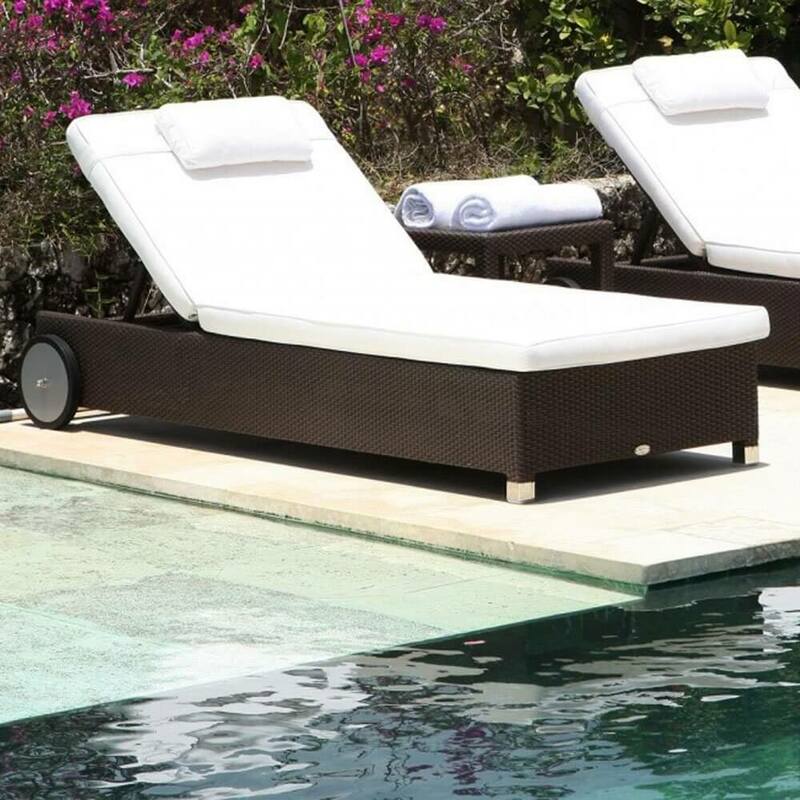 Inside the slatted teak wood base features two reclining head rests positioned top and tail so you can converse with your loved one's easily as you enjoy poolside Pimm's. Comfortable mattresses and showerproof curtains with tie backs then offer flexibility for afternoon naps when closed or relaxed evening entertaining once opened. 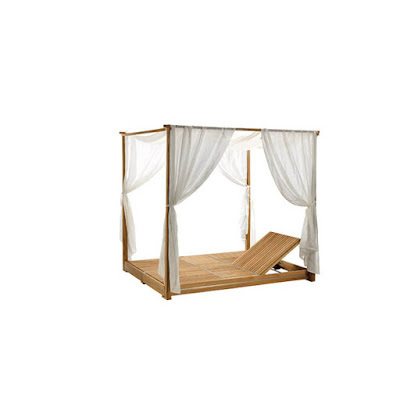 A luxury for spot for shade-seekers this summer, this luxury outdoor daybed creates a welcoming sanctuary from the warm rays of the summer sun. Strengthened by a robust powder coated aluminium frame, Cabana's characteristic synthetic rattan exterior is vertically woven from a durable, heavy duty polyethylene strapping, 5cm wide with a weatherproof Silver Walnut finish. Encouraging an unrivalled comfort, an ultra-padded mattress then completes the aesthetic with accenting back scatter cushions, each with a Category B showerproof fabric upholstery. 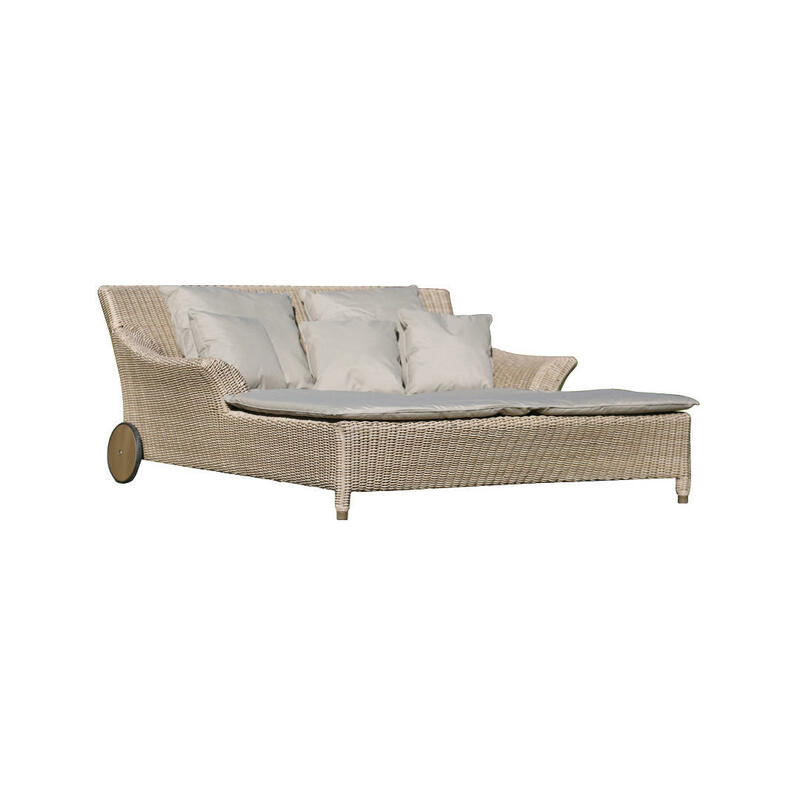 There's nothing more relaxing than soaking up the sunshine so do it in style with the Cane-line Savannah Daybed Module. 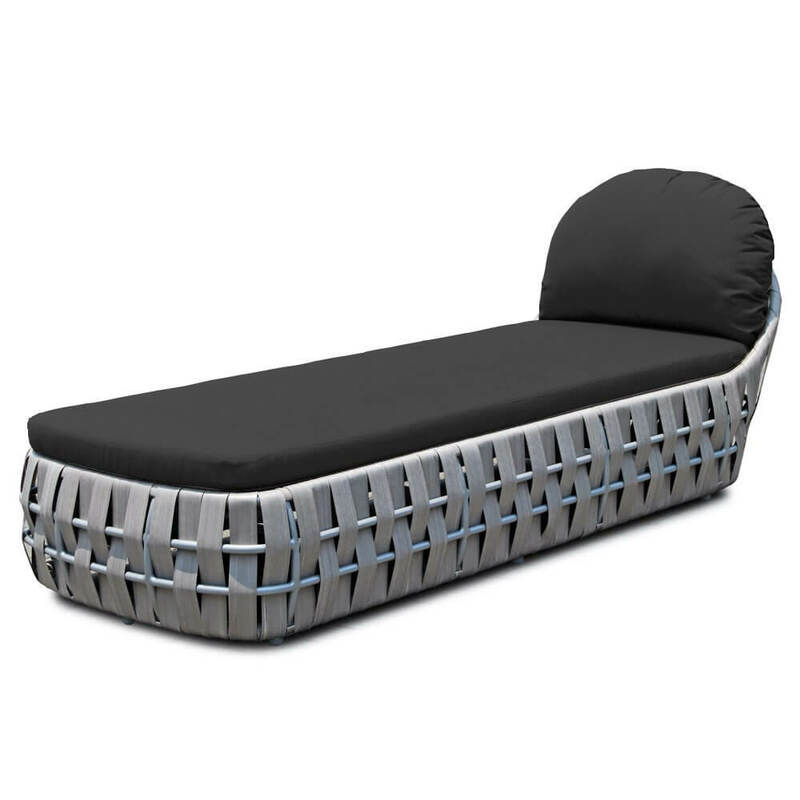 This daybed features a UV and weather-resistant solution dyed polyethylene exterior which is woven around a strong galvanised steel frame. Savannah's generous curves and striking overhead canopy provides an exquisite injection of chic contemporary style into outdoor areas.Specifically developed for outdoor use during the spring and summer months, Cane-line weave withstands moisture and atmospheric conditions and features an inherent elasticity for optimum comfort.Ultra-padded QuickDry acrylic cushions then accent the design for ultimate al fresco relaxation and their innovative foam inners ensure quick drying after unexpected rainfall or poolside splashes. 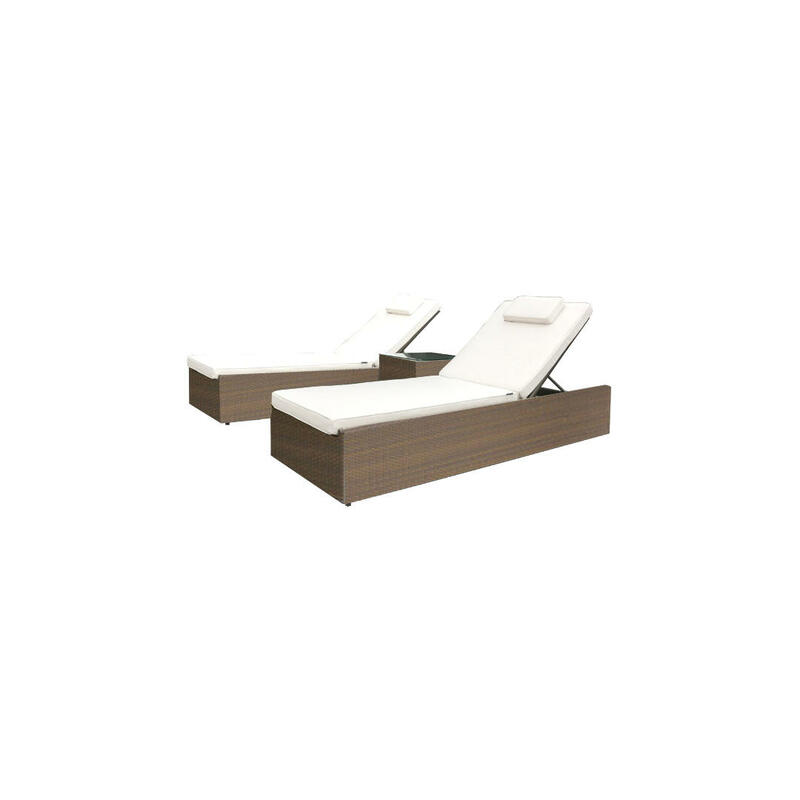 Relax in comfort and style with this set of two Valencia sunloungers and one side table from Westminster. Made with an all-weather, durable Viro resin weave on tough aluminium frames, this set can be left outside without a care. When its time to enjoy the sunshine, choose from 5 different reclining positions on the chairs and rest back on deep-filled cushions made from all-weather Sunbrella fabric. The side table has a toughened glass top and is the perfect height for keeping drinks or books within easy reach. 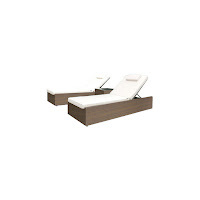 Traditional seating has been captured in an appealing design with the Valentine sunbed for two. It comes complete with luxurious cushions to ensure extra comfort. A woven range, Valentine features chairs, tables and benches which are made from a durable weave to create the ideal garden or conservatory furniture. An arched headrest then achieves an elegant form as an ultra-padded mattress and back cushion with showerproof exterior channels an unsurpassed level of comfort.